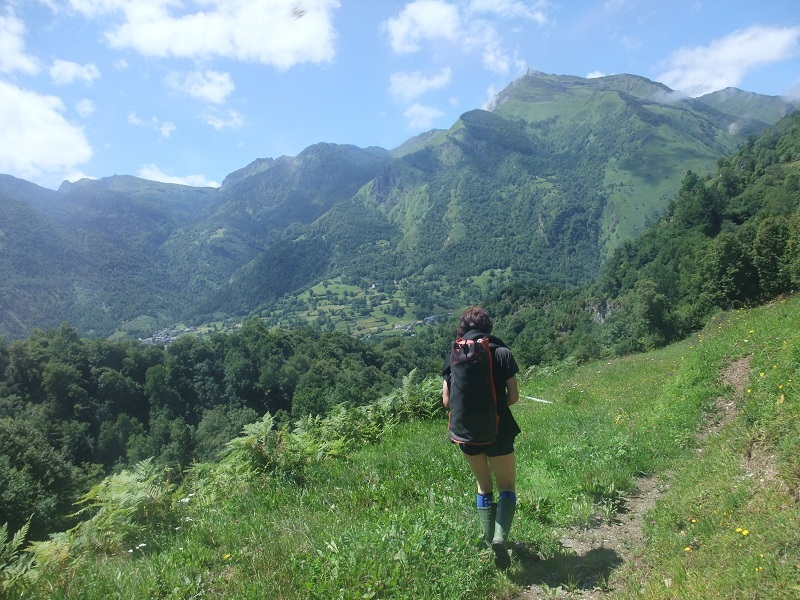 Cap de Pount is a long walk up from the carpark up a valley and through a long cow meadow. We found the exit of the gorge and got changed, then walked up the slope and around it into another meadow after only a few hundred metres. Is that it? Becka said. Yes, that is the lot. You could see into part of it from above. I have been on the case of the Energy Performance Certificate database for a long time. 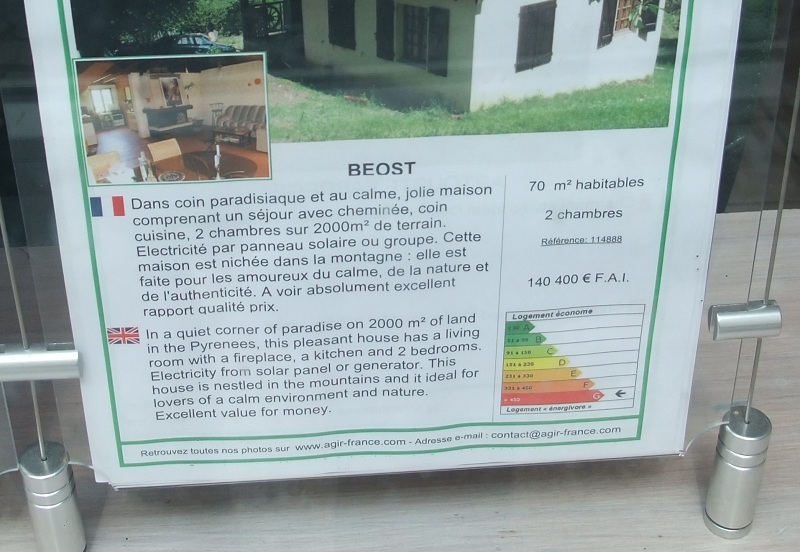 This is a European mandated scheme for rating houses on the market so people can know if they’re buying a gas-guzzler or not. Or, to put it another way, if you invest money into insulating your home and making it more energy efficient you should expect its value to go up, even if it looks exactly the same as all the other houses in the street (even though the changes are invisible if they are not solar panels). I am in pursuit of the bizarre determination that the EPC database constitutes private personal information. I am also looking at the company that has been contracted to run the database, Landmark Information Group Limited. First, I asked for the contract. Once again my camera stayed safely in several layers of dry containers for the entire trip, which is why it still works. 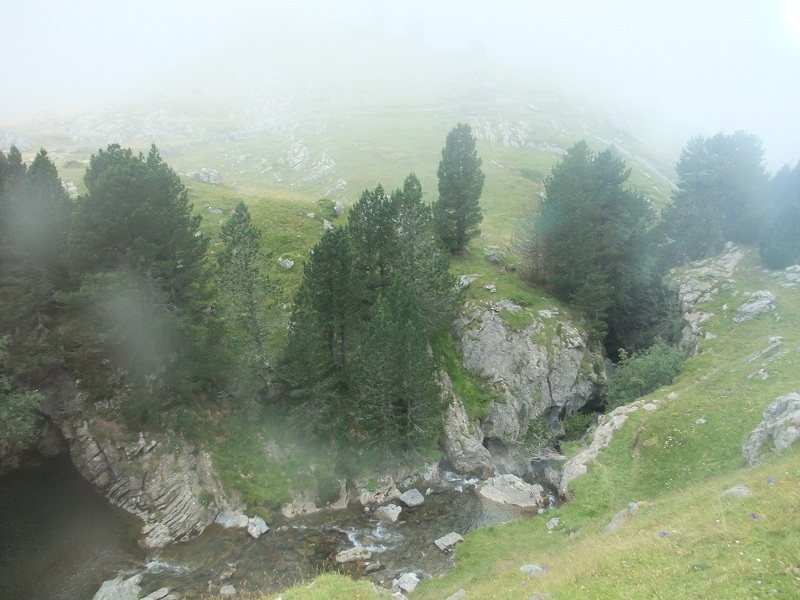 I’d been staring at the egress of Bitet Inferieur canyon on the road up to Portalet since first day we passed it on bikes and saw five people coming out of it grinning ear to ear. There was no way I was going to persuade Becka I was competent enough to take us through it. She knows me too well. And we didn’t have a guidebook (the internet has de-listed it as illegal). What we needed was someone competent to take us there. I wonder if the Tourist Information could sort this out. A complete waste of time was had one morning recently, following a Decision Notice document dump that came through the post shortly before we set off for France. The government wants to improve the structure and development in the national high-tech economy, which it knows is dysfunctional on account of there being so many successful and utterly incompetent large businesses, while at the same time small competent businesses that should grow and displace them are not able to survive. Hint: why not stop giving huge failing contracts to these big businesses, and break them up into a scale where it can be done by small suppliers, like it says in the manifesto? Instead, what the government did was consult with the experts in business capital finance who are responsible for the situation, and they persuaded them to bail them out with a public subsidy on the basis of what they called the equity gap. The only way a new company could expand to that critical size is through capital investment of at least £y millions, because doing business at a smaller size was not an option. However, the venture capital industry is only willing to put money into companies of a certain size of at least £z millions, because they need to live off a healthy cut of the business. So there is an equity gap between the value of the entrepreneur selling their own house for £0.q millions and £min(x, z) millions which creates a barrier that protects the larger companies from any effective competition. The answer was, among a lot of other programmes, Capital for Enterprise staffed entirely by people from the finance industry. I learnt about it only when Vero Software got bailed out by a benefactor of this fund. I read up about some of the bureaucratic arrangements in the programme and found this part of the guidance. Hm. I wonder what these Investee Summary Sheets look like, and what they’re doing with them? Apparently nothing. They wouldn’t give me any. And the Information Commissioner concurred that they shouldn’t give me any. It’s worth reading the report which confirms my evidence that the Department is not even internally conducting any analysis whatsoever about how all their bailed out venture capital companies are performing, in terms of extracting bloated fees, or their habit of overlooking viable businesses on the basis of their bogus financial models — hence the whole nonsense about the equity gap. At the very least, they should be capturing enough information to prove or disprove the truth of the equity gap myth, and whether this intervention is actually filling it — if it exists. So, the Investee Summary Sheets are filed in a box somewhere and completely ignored. And no one is allowed to see them. Oh, an Information sheet — JUST FOR ME! Hm. That’s not very informative. So, to be clear, if the ECF decides in their infinite wisdom that a company who has applied for funding is not up to the job of accepting investment, this determination should be kept secret in the commercial interests of the that company in case they are able to con money out of some other investor who would otherwise be more wary of parting with their money if only they knew. In other words, the ECF are saying that they want people to put money into companies they know are bad investments. Either that, or they don’t want their investment decisions ever to be scrutinized. Because, as we well know, the business itself perfectly well knows what’s what; it’s all passing around the grape vine among the same crowd of people; because when an application from a company lands on your desk, you will of course ring round your colleagues to see if anyone has heard of it; and they will tell you; that’s how business gets done; and if one of your friends who is acting as an agent for that company has polished it into a professional standard application, so much the better. Anyhow, just to draw this to a close, the logic obviously doesn’t apply to companies that we do know have applied. 1) A copy of the Investee Summary Sheet for Vero Software plc, as disclosed in its loan agreement press release 2009-12-04. 2) A copy of the Investee Summary Sheet for Documentric, as disclosed in an article dated 2009-09-29. 3) A copy of the Investee Summary Sheet for Qire, as disclosed in a press release on 2010-06-01. 4) A copy of the Investee Summary Sheet for Monumental Games, as disclosed in a press release dated 2009-12-16. 5) The number of Investee Summary Sheets that have been received by ECF in 2009 (the year of establishment), 2010 and 2011. 6) The name of Capital for Enterprise Fund portfolio company described in Paragraph 33 of the Notice, which suffered adverse publicity resulting in a noticeable aversion by investee companies. 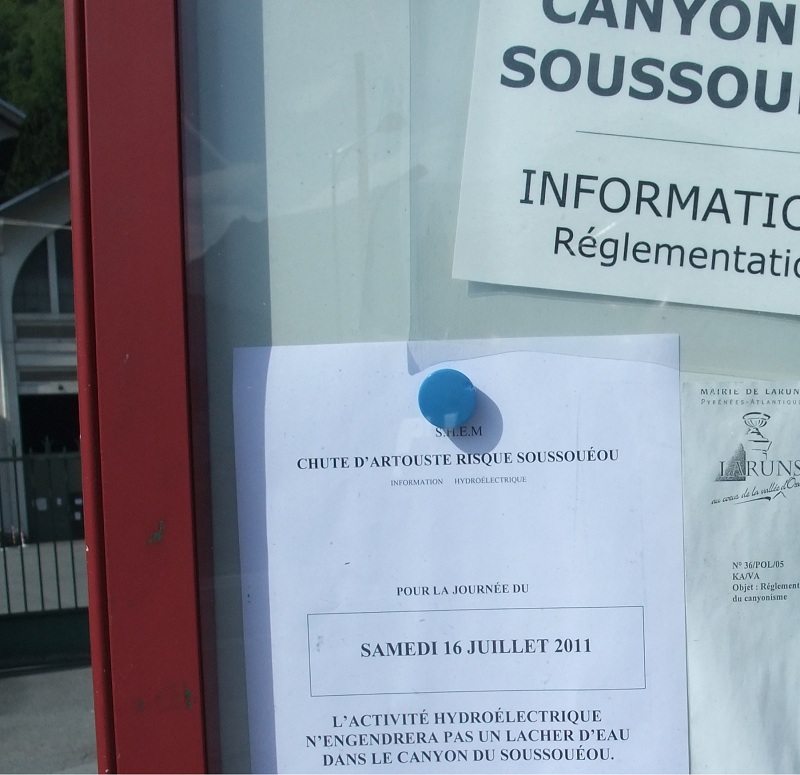 Subject to climbing a fence and getting round a difficult landslide, you can walk to Canyon du Canceigt from our door. 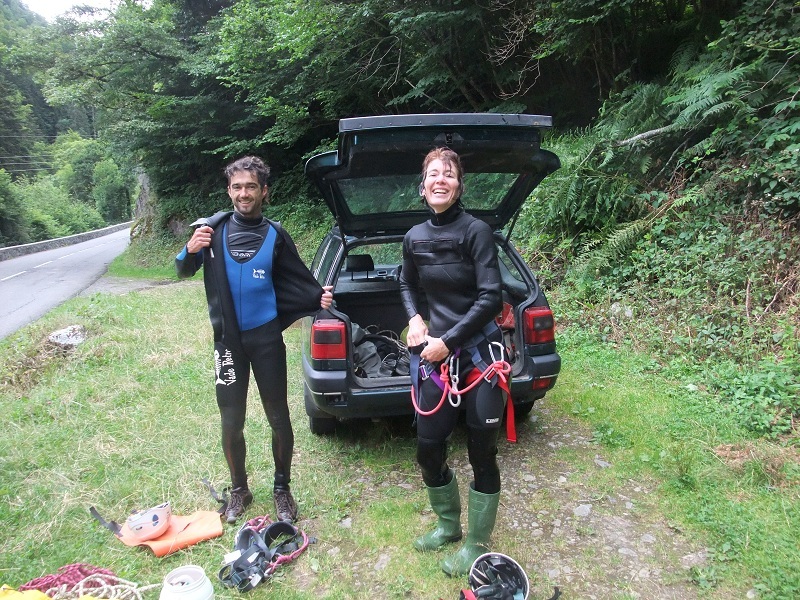 Becka saw busloads of small children getting changed into wetsuits down by the river, so we decided that maybe we were up to it. It’s a very pretty canyon with overhanging cave-like walls and flowstone and light everywhere. At one point there is a mat of ivy dangling down in free space by about 20 metres almost to the floor. When we first moved into this apartment 10 days ago (we have one day left *sob*), the landlord saw our bikes on the back of the car and invited us for a quick tour round the Col de Marie-Blanc, which was the first significant col to happen on our Raid Pyrenees in 2006. We suggested probably not. For him it was a quick 2 hour work out. For us, when we did it on 17 July, it was a four and a half hour slog that would not have been entertaining to keep down with. We did it in the east-west direction, thus avoiding these very sharp sections on the way up. 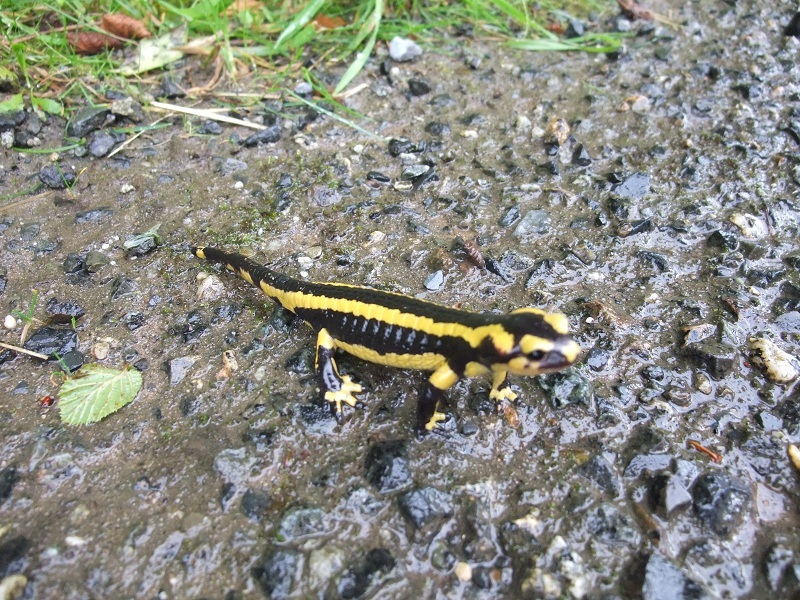 It was rather rainy, which good weather for dopey salamanders on the road. I took the plunge and made the online slicing application live today. Read about it on the Free Stuff page. Reverend Billy made an appearance in Martin’s street! I encountered this guy when he came to Liverpool in 2003 and caused people to do a shopping intervention in the local John Lewis store. Big stuff going on back home while I mince around on silly bike rides and caving trips in the south of France. Too much to do. Too little gets done to make any difference. Life just whips by. Somehow this pair of numpties got themselves into, through, and out of two canyons today. It was a sunny Saturday in July and Canyon du Soussoueou touts le monde was there: spaniards, french, plenty of children in guided groups. We were probably the only persons to bother to check out the sign printed out and pinned up daily on the notice board of the hydro-electric power station. Hey, ever heard of a web-page? Well, at least the numbers forced us to stop wibbling and try to look competent. This included pretending to know which were the toboggans and where you were supposed to jump. Nothing looks so stupid as spending 5 minutes setting up an abseil rope down a waterfall as 30 kids streaming up behind you and jumping over the ledge into the pool. Except, maybe, jumping off and breaking your legs on a rock that you couldn’t see because of the white foam. The Tour-de-France passed through town (Laruns) today. On advice from someone who follows these things, the best place to watch it was near the top of a big climb at the end of a straight section of road. 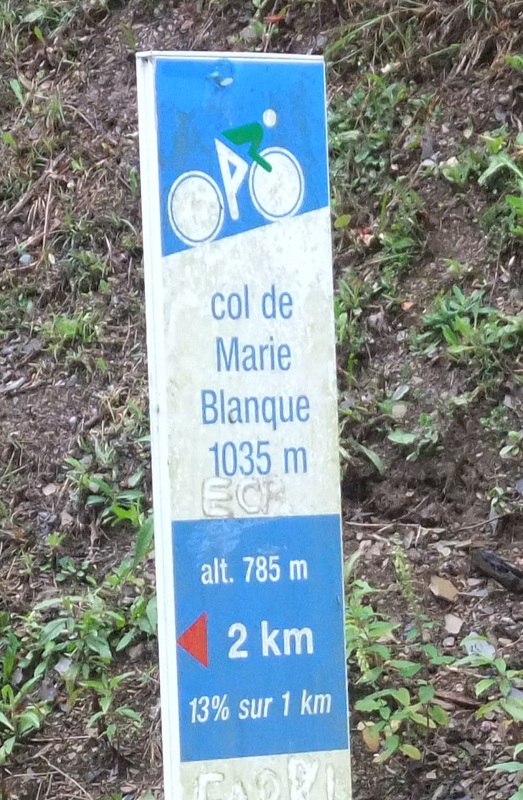 We selected our spot 2km short of the summit of Col d’Aubisque, which meant unfortunately we had to cycle up there in the morning. The road was already lined with camper vans and french families all set out in deckchairs at ten in the morning. What a climb. Becka calculated that it took us a factor of six times longer than the Tour-de-France riders. I set up the our small picnic on a steep verge on the other side of an electric fence (while Becka went up to the summit and back). The quiche was a disappointment. No one told us about the “Caravan”. This was an endless series of corporate products on processions of floats winding their way up this desolate mountain pass like an advertising vision in augmented reality. Loud music, people in harnesses dancing, stupid giant models of the product packaging, and then several extra vehicles throwing gifts out the sides. If you were lucky the gifts were edible. But most of the time they were stupid things like keyrings, newspapers, fridge magnets, crappy hats and unexplained useless bits of plastic from the bread company.